Hot cheesy Chicken Parmesan Stuffed Shells Recipe, a family dinner no one can resist! Heaven in a pan. That’s what I’m serving today. 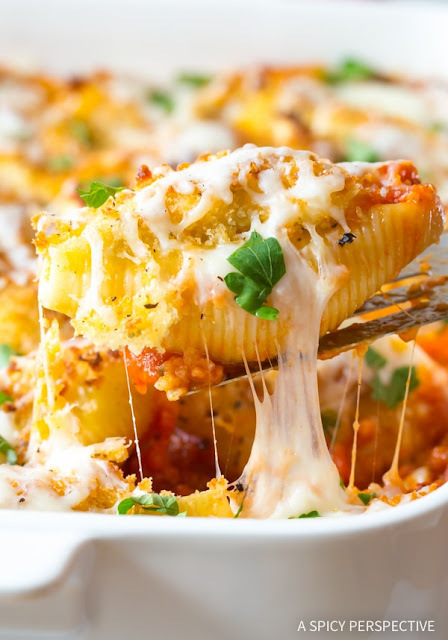 Hot, molten, cheesy, saucy, golden, crispy topped, carb-alicious heaven. Preheat the oven to 400 degrees F. Pour the marinara in the bottom of a 9 X 13 inch baking dish . Place a large pot of salted water over high heat and bring to a boil. Once the water is boiling, drop the pasta shells into the water and cook for 6-7 minutes, until almost cooked through. Drain the pasta. Meanwhile, place the ricotta, parmesan cheese, egg, Italian seasoning, garlic, salt, and crushed red pepper in a bowl. Mix well. Then stir in the chopped chicken. Spoon the ricotta mixture into the shells. One at a time, dip the top (open side) of each jumbo shell in melted butter, then roll the top in panko bread crumbs. Place the shells panko-side-up in the baking dish. Bake for 20 minutes in the center of the oven. (If the bread crumbs aren't turning brown by the 15 minute mark, turn the boiling on high for the last 3-5 minutes.) Remove the baking dish from the oven. Sprinkle mozzarella cheese over each shell. Then bake (at 400) for another 5 minutes to melt the cheese. Serve warm.